With or without a rhyme or reason, you can count on coding changes popping up throughout the year. 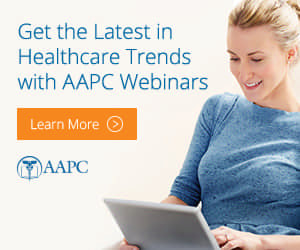 In addition to April updates to the Medicare Physician Fee Schedule (PFS), providers billing under the Outpatient Prospective Payment System (OPPS) should be aware of four new CPT codes, a new advanced diagnostic laboratory test, additions to the Comprehensive APC exclusion list, several new drug codes, and more. CPT® codes 0080U – 0083U were released too late to include in the January 2019 OPPS update, so they are being added to the April 2019 Integrated Outpatient Code Editor (I/OCE) with an effective date of Jan. 1, 2019. CPT code 0081U has a status indicator A, which means it is not paid under the OPPS. The other three codes have a status indicator Q4, which means they are paid at the Ambulatory Payment Classification (APC) rate; packaged or composite payments do not apply; and if there is no reimbursement value, they are paid under the PFS. Effective Jan. 1, 2019, CPT code 81538 Oncology (lung), mass spectrometric 8-protein signature, including amyloid a, utilizing serum, prognostic and predictive algorithm reported as good versus poor overall survival) is approved as an advanced diagnostic laboratory test (ADLT) under the Clinical Lab Fee Schedule (CLFS), but is not payable under the OPPS. The latest additions to the Comprehensive APC (C-APC) exclusion list (per Addenda J) include brachytherapy sources, self-administered drugs, services assigned to OPPS status indicators F and L, certain Part B inpatient services, and therapy services. Seven new C codes have been created for reporting drugs and biologicals in the hospital outpatient setting. The codes are listed here. Additionally, the HCPCS Level II codes below will change from status indicator K (non-pass through status) or E2 (items and services) to G (pass-through status), effective April 1.
values published in the January 2019 update of the OPPS Addendum A and Addendum B. The updated payment rates are available here. Also note that the following codes will have payment rates corrected retroactively to July 1, 2018. Providers may resubmit claims affected by the adjustments. These codes are paid under OPPS and payment is packaged into the payment for other services (status indicator N). As stated in the 2019 OPPS/ASC final rule, pass-through payment status is in effect for Chimeric Antigen Receptor (CAR) T-cell therapy codes Q2041 (Yescarta) and Q2042 (Kymriah). Although Medicare does not generally pay separately for the steps required to collect and prepare the T-cells (CPT codes 0537T, 0538T, and 0539T), effective April 1, these codes and the related revenue codes 087X (Cell/Gene therapy) or 089X (Pharmacy) and value code 86 (Invoice cost) should be reported on outpatient claims for tracking utilization and cost data. Effective Jan. 1, 2019, hospitals are required to report modifier ER Items and services furnished by a provider-based off-campus emergency department on every claim line that contains a code for an outpatient hospital service furnished in an off-campus provider-based emergency department. For complete details, see MLN Matters MM11216, released march 15, 2019.